This is how to do pre-season training – get as pumped as strongman and Game of Thrones star Hafþór Júlíus Björnsson. 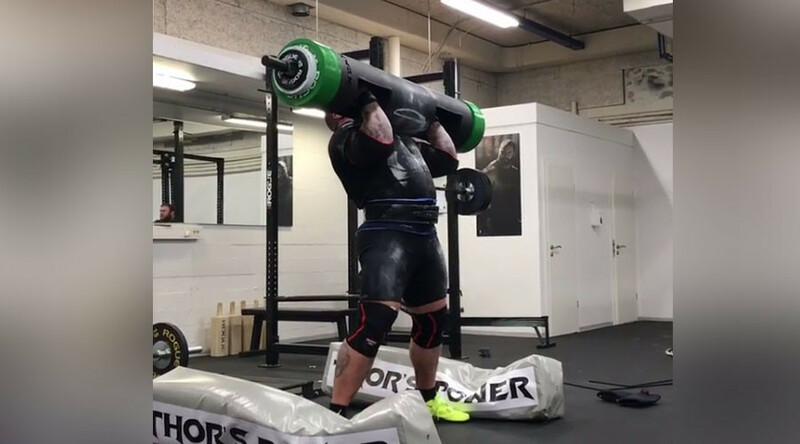 The Icelandic strongman-turned-actor Björnsson posted a video to his social media with his training team lifting the 455lb log over his head while being raucously cheered on, before celebrating the personal best lift heartily. Björnsson also posted videos of himself doing sets with “light” 880lb beltless yoke that comprised his deload. Prior to breaking into mainstream acting and finding fame by playing grisly Gregor ‘The Mountain’ Clegane in the HBO adaptation of Game of Thrones, the 28-year-old former basketball player was on the fringe of an NBA career before a knee injury ended his days on the court. He subsequently got involved in powerlifting and began his assault on the strongman rankings. Standing at 6ft 9in, Björnsson has finished in the top three of the World Strongest Man competition for the past three years, as well as being crowned Iceland’s Strongest Man in 2011 and 2012. The athlete – known as ‘Thor’ – has a squat record of 550lb, can bench press 507lb and deadlift 925lb.Björnsson is also the ‘strongest Viking in history’ after he beat a 1,000-year-old record set by Orm Storolfsson at the World's Strongest Viking competition in Norway, by carrying a 1,433lb (649kg), 30ft log on his shoulders for five steps. Björnsson’s talents don’t just extend to acting and weightlifting. In 2016 he was filmed sparring with MMA superstar Conor McGregor in the Irishman’s training camp.